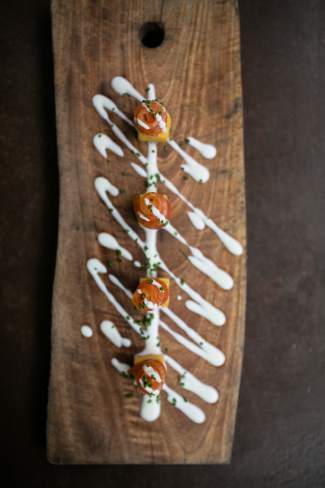 Vin 48's Smoked Skuna Bay salmon is seen resting on a Johnny cake topped with creme fraiche and chives. The smoked salmon is just one of nine small plate specials currently on the happy hour menu at Vin 48. In reference to the old adage “sharing is caring,” the tables of Vail Valley eateries are establishing themselves as very generous spots. Specifically, while entrees have traditionally taken center stage throughout the restaurant scene, many local restaurants have turned much of their focus on small plates to share. Local chefs and restaurant owners have seen a trend toward diners wanting more of a tasting experience, and small plates give many culinary minds the canvas to paint an assortment of distinct flavors. While some chefs feel the heat to deliver on smaller plates, many around the valley are using the opportunity to create something memorable for the whole table. Here are a few featuring smaller bites, but big flavor. Executive Chef Julian Smith is excited by the trend of smaller plates and sees it as a unique opportunity to put together a tasting experience. “It’s approachable for our diners to try a little bit of everything and share it amongst the table, as opposed to being confined to one experience throughout their meal,” he said. Similarly, Smith finds that smaller share plates allow diners to work out more reasonable portions, and that sharing many different bites and flavors is one that works especially well in the space at Bol. While Bol’s menu features many popular dishes, Smith suggests the honey glazed ribs with peanuts and cilantro as one that’s indicative of Bol’s full throttle flavor. The Remedy is the newest addition to the Vail small-plate scene and can be found within the renovated space in the Four Seasons. Executive Sous Chef Marcus Stewart explains that the trend toward smaller share plates is understandable, as eating has become just as ubiquitous as sightseeing while on vacation. “The trend of small plates really speaks to social experimental dining. Many of our guests travel far and wide and have educated palates, and small plates are an opportunity for them to sample and experience more,” he said. For a slice of Stewart’s signature style, the chef suggests The Bison pizza, which uses house-made charcuterie bison pepperoni and is a favorite menu item at the new spot. Owners and chefs Bryan and Jessica Redniss, of The Rose in Edwards, enjoy creating smaller share plates as an opportunity to play with different ingredients and highlight Colorado flavor. “We work a lot with local produce and ingredients, so sampling different flavors on small plates with the changing seasons allows us to have fun when new things are available,” Jessica said. “It’s exciting for us in the kitchen because it adds a playfulness to the menu, and our guests don’t have to commit to one thing,” Bryan said. “Our menu is always evolving with the season. Right now we have a pickled watermelon and pork belly salad that is one of my favorites; the watermelon is such a complement to the pork belly, and we season the dish with local herbs,” she said. At vin48 in Avon, owner Collin Baugh thinks that the popularity of small plates has grown over time. “Over the years, our small plates have had an even bigger menu presence than our large plates, and people are embracing it as a better way to dine,” he said. Not only has the idea of smaller share plates increased in popularity, but the time and creation that the kitchen puts into its smaller dishes has also been important for the restaurant. For a sample of vin48’s outside the box thinking, Baugh suggests the braised el regalo raised goat, which features Colorado-sourced goat. The enthusiasm toward small plates is one that chefs and diners can agree upon. “It provides a great mix of what I can do as a chef,” said Bol’s Smith. This mutual attraction to small plate dining is solidifying it as more than a trend, but a food movement that’s here to stay.